"Considerable effort has gone into the study of various aspects of flammability and of various plastic materials, so that these materials which are proving so useful to man will always be used in ways which will not compromise his safety. The task is a continuing one, because the family of plastics continues to grow, and, along with it, its variety of applications. Some of these future applications cannot even be conceived of at the present time. The needs of man and his society are changing, and with them the factors that affect his safety, comfort, and convenience. A flammability handbook for plastics must necessarily involve a variety of sciences and technologies spread across the whole spectrum of human knowledge, and it is impossible to discuss all the subjects in great depth. Any details extracted for attention are brought because they are believed to be significant to the overall effort to make plastics as useful and safe as humanly possible." 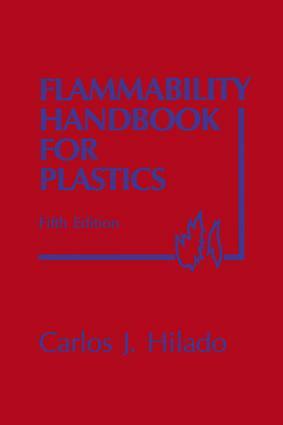 The Flammability Handbook for Plastics is a unique resource . . . While there are other books on flammability, none are as concise or as "data rich" as this one . . . This is the first place to look!